Jaguar F-type (2013-on) – from £39k! Need a two-seat sports car to remind you why you fell in love with driving in the first place? Of course you do – that’s the easy bit. The hard bit is deciding between these two, both now a Ford Fiesta less expensive than they were new. Jaguar’s still-beautiful, still-wonderful F-type comes in a multitude of guises but the big divide is cylinder count: supercharged V6 (in 335bhp or 375bhp states of tune) or supercharged V8 (488bhp or 542bhp). Both have their fans, the V6 enthusiasts citing better balance and a marginally lighter nose as the less powerful car’s key strengths, while the V8 acolytes just laugh, light up the rear axle on a breath of throttle and make for the horizon like a meteorite lashed to a Daytona-ready V8. 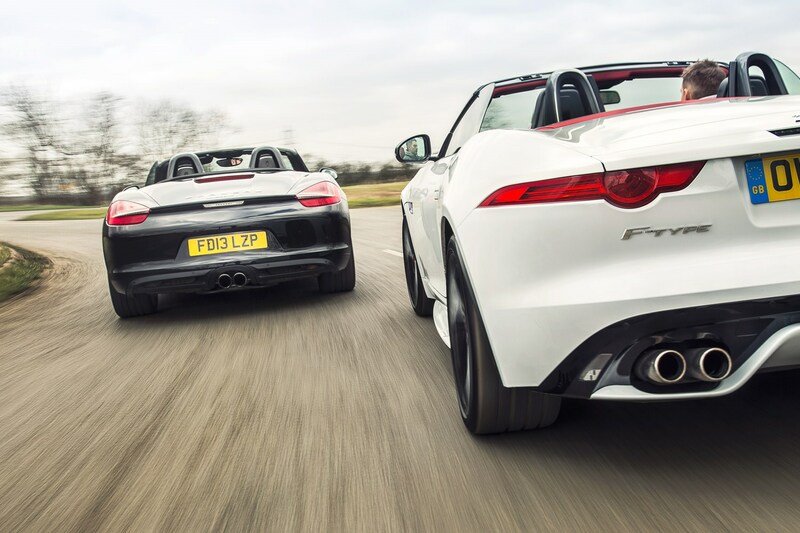 Whichever way you go, the F-type’s essential brilliance is its unrivalled ability to improve your day. Climb into the surprisingly cosy cockpit – how a car this big can seat just two remains a miracle – note the perfect driving position, drop the roof regardless of the weather and, childish though it may be, enjoy the engine’s exuberant flourish on start-up. Get moving and, while the Jag never quite stops feeling substantial, you’ll be laughing like a lottery winner inside five miles: the compelling turn of speed, the filthy noise, the essential sweetness of the chassis, with its admirable ride quality and trustworthy front axle, and the knowledge that you’re piloting one of Jaguar’s finest sports car shapes. Used F-type values run from silly-money Project 7s (circa £200k) through £80-£90k low-mileage V8s and £55-£60k clean 375bhp V6s to the most affordable of the breed, early convertibles with the 335bhp V6. Cared for, approved used cars go for less than £40k, a £15k saving over a new car with the same engine. Best for thrills is the F-Type R coupe with the auto gearbox in rear-wheel-drive form. The bodyshell is considerably stiffer than the convertible, making it a better basis for a sports car, and the V8’s minor weight disadvantage is instantly atomised by its healthy power and torque advantages. You can only have the R with the auto ’box but all-wheel drive is an option – swerve it, feel alive. For cruising might we suggest a V6 convertible, again with the auto ’box? The manual’s just not that slick or rewarding to use. Porsche Boxster S (2012-on) – save £10k! So the Jag’s a great car, and tempting, but the Porsche Boxster looms over the sports car market like those city-sized flying saucers in Independence Day. There are some Amazonian tribes (from the jungle, not the online retailer’s equally substantial ‘fulfillment’ warehouses) unaware of the new Boxster’s move to turbocharged four-cylinder power with the 718, but for the rest of the world the matter’s been the subject of heated discussion. Two things have been agreed upon: that the new one is not bad, and that the ‘old’ one, the 981 with the naturally-aspirated flat-six, remains ridiculously desirable. Just as the Ferrari 458 adds a fair chunk of historical significance to its essential brilliance, so the 718’s arrival makes the 981 look like a really, really good idea. The third-generation Boxster launched in 2012, with a stiffer, lighter and prettier body than the outgoing 987. Pick of the bunch has to be the Boxster S, its marginally lower limits and increased fluidity nice bonuses alongside less salty prices when compared to the admittedly nice GTS. Then you must decide between the PDK or manual ’boxes. Both are sublime, with the manual shading the PDK on tactile joy but the excellent twin-clutcher fighting back on performance (it shaves 0.3sec from the 0-62mph time) and practicality, working as a smooth and intuitive auto when you’re in traffic or keen to get home with minimum effort. While hardly essential, the Sport Chrono package (clock on the dash, Sport+ mode for sharper responses, dynamic engine mounts) and PASM suspension bring yet more versatility to an already special package.